The sort of thing that R… Rajkumar is is the Tamil-Telugu masala entertainer, like Run or Ghilli. It’s loud. It’s brash. It’s in your face (and in your eardrums). For some of us, it’s also in our blood. Some types of cinema you learn to like. You watch it and read about it and talk about it and develop a taste for it. Some types of cinema you simply have a reaction to, like an itch or a spasm – you have no control over it. You smile at something silly, like the hero and his friend making an entry into the rival gang leader’s house amidst a herd of cattle. (Would this be a Trojan cow?) You laugh – sheepishly, of course – when an old man in the burning building asks for ice water so he can have a drink. Prabhu Dheva, in the tradition of this kind of cinema, thinks not in terms of what the narrative arc of the film is but what the arc of each scene is, even if what’s happening in this scene doesn’t really tie in with something that will happen five scenes down. What’s important is the instantaneous kick. And that this film dishes out fairly well. The problem with this kind of cinema is that it’d probably work best as a two-hour show reel of highlights and our filmmakers almost always insist on adding the extra half-hour or hour. There’s just not enough plot or characterisation to sustain these films for that long. R… Rajkumar makes that mistake as well. But at least for a while, there’s enough gonzo nuttiness to keep you amused – like a villain who likes spilling whiskey, or another one with a penchant for shiny shirts and Marilyn Monroe neckties. The director’s talent in giving “punch” to each scene is evident in the stretch where the evil Shivraj (Sonu Sood) first sets eyes on Chanda (Sonakshi Sinha). He’s taking dips in the temple pond – she is too – and as he sinks, she rises, and as she sinks, he rises. There’s just enough slow motion to alert us. It’s the turning point in the film – she loves Rajkumar (Shahid Kapoor), who works for Shivraj – and every last drop of juice is squeezed from it. Take away this romantic track and you have the Yojimbo-like story of a drifter – Rajkumar – wandering into a village where two rival gangs are perpetually at war. (One is headed by Shivraj; the other by Manik Parmar, played by Ashish Vidyarthi.) And like the protagonist of the Kurosawa film, Rajkumar allies himself with one gang, endures a severe thrashing and ends up being helped by a friend, and here too we have a woman who loves one man and faces the prospect of leading a life with another and is treated like chattel. And from this base, Prabhu Dheva takes off and does his own thing. He Indianises the material not just with the masala treatment but also by quoting older film songs (Aji roothkar ab kahan jaayiyega and Khush rahe tu sada yehi dua hai meri) and by including emotional highs (there’s a good solidarity-of-the-small-men bit at the end) and by moving the woman further up in the chain of events. We first see Chanda as Rajkumar first sees her, in the midst of a fight between Shivraj’s men and Manik Parmar’s men. It’s love at first sight. And it’s the film’s motto as a visual: Pyaar, pyaar, pyaar… Maar, maar, maar. This is the tone throughout. There’s an engagingly silly running gag that Rajkumar forgets everything when she sees Chanda – if he’s fighting, he just stops and stares at her. This comes full circle at the end, when he is fighting for his life and he sees her and just stops, even as the blows rain down on him. In a more elevated kind of film, this would be an exalted moment – pure love, or something like that. Here it’s just a kick, a rush of cheap (but effective) sentiment, and it’s just for that moment. But it works. The major question that hangs over R… Rajkumar is whether Shahid Kapoor is the right actor to be doing all this. He’s fine when he calls Chanda his lollipop and makes appropriate sucking noises while squeezing his lips into a kiss. (And with Prabhu Dheva being the prankster he is, lipstick marks appear on Rajkumar’s face even when Chanda kisses him from a distance.) And we’re constantly made aware of his slightness. At one point, after Manik Parmar calls him a child, Rajkumar leaps up and fastens his legs around the man’s waist… like a child. But when he’s asked to mouth lines like “Silent ho jaa varna main violent ho jaoonga,” we don’t buy it at all. Shahid is very good in the masala-lite mode of a Phata Poster Nikla Hero, but even with his macho stubble, he looks a bit lost amidst all this industrial-strength posturing, the kind that an Akshay Kumar does so effortlessly in a Rowdy Rathore. I wish the action scenes had taken a cue from Jackie Chan’s films, where the star’s light stature is used to his advantage. He’s faster than the hulks around him, and he has an edge. But there’s no wit in the stunts here. They’re the usual compilation of broken furniture and broken beer bottles, and they go on and on. And I really wish they’d get rid of the plot point towards the end where the hero is stabbed, and we’re supposed to wonder if he’ll rise again. Is there a doubt? Can’t we find more inventive ways to enfeeble him? But at least in the songs sequences, we see why Shahid was cast. Is there a dancer who moves as well as he does, and who radiates as much joy to the audience? Pritam supplies the film with just the kind of soundtrack it needs – catchy beats to go with the inventive nonsense-lyrics. And the madcap choreography, mostly, is a joy. In Gandi baat, the dancers register mock-disgust at the gandi baat by slapping their foreheads. In Mat maari, Chanda kicks Rajkumar in the crotch, and without missing a beat he follows up with woozy steps where his knees are pinned together. In Dhokha dhadi, during the refrain “ud gaye,” they spread out their arms and make motions like children pretending to fly a plane. And in Saree ka fall sa, a backup dancer opens a giant doorway in the middle of a desert, leaps through it and races past the leads and keeps running till he joins the extras in the background. This is another thing R… Rajkumar knows that Bullett Raja didn’t. Amoral masala-movie heroes can’t just be shooting bullets. They need to shake some booty too. @B..Rangan: Such a big review required for this crap movie ? Or you didn’t want to easily let of the filmmakers ? – I think the latter. Man it seems that you had a good time watching this one.I thought you didn’t like this kind of films. I was thinking of giving this one a miss you know Shahid as an action hero and all , but after reading your review , i am intrigued.Were you genuinely entertained by this one or were you writing this in comparison to bullet raja which i also found boring?. If there’s anything this review conveys, it’s the extent of your disappointment with ‘Bullett Raja’. Only in the context of that disappointment can a headache-inducer like this get even a mild thumbs-up. I saw it yesterday and am still swallowing aspirins. I love ‘masala’ films. Really, I do. As long as they are well-made. ‘Dabangg’ is a staple watch for me. And that is because that film understands that even a ‘masala’ film has to be well-scripted. It needs a narrative that’s engaging, characters that register as human beings as opposed to cardboard cut-outs, good staging, well-choreographed fight scenes, and truly whistle-worthy dialogues. I found none of that in ‘R…Rajkumar’. You speak of “moment-to-moment vitality.” Where’s that in this film? It’s obvious from the start that Shahid Kapoor has been sent by that big mafia guy in Hong Kong to get rid of the warring parties; which is why the whole “twist” about the corrupt cop discovering this has no punch. If the scenes between Raja and Rudra in ‘Bullett Raja’ were, as you said, “perfunctory”, so are the scenes between Shahid and his friend here, which is why the bit about him helping Shahid at the end packs no wallop either. The romance is equally flaccid. Barring that lipstick-mark-appearing-through-cellphone bit, there’s not one charming bit in the whole affair. The villains are as lacklustre as they come (and no, the apparel doesn’t make a villain intriguing, his capacity for evil does). The solidarity of the small-men bit could have been a seriously rousing ‘masala’ moment, but it comes so out of nowhere that it only adds another layer of ludicrousness to the whole affair. So these henchmen who had been loyally serving the villains and seeing other small men being beaten up and killed all the while suddenly change their minds on the spur of the moment? I know the ‘masala’ universe isn’t ruled by logic, but there has to be some sort of build-up to what is supposedly a ‘big’ moment, isn’t it? The fight scenes are the same old, overlong, chaotic, yawn-inducing stretches of ‘dhishum-dhishum.’ And yeah, Shahid as a larger-than-life action hero is the zenith of miscasting. Yeah, he dances extremely well, but, reversing what you said in your last lines, “Amoral masala-movie heroes can’t just be shaking booty. They need to shoot bullets too. And land punches and kicks. And look convincing while they do it.” After all, it’s primarily an action film. So if the hero looks out of his element in the fight scenes, there’s only so much that his skills as a dancer can do to salvage the film. All in all, this is, to me, is a disappointment, like ‘Bullett Raja’. Sure, the latter is a bigger disappointment because it’s made by a better director and had a more engaging premise. But this one isn’t all that better. Heck, it’s hardly better. Oh i love these kind of films , this is a proper Indian Thaali meal cinema and as BR something we are “born” to enjoy. @BR : BTW – i love to watch Vijay dance as well though this is not the best example of that , ,me suspects madam Shriya had something to do with the appearance of this song here. I think I know what you mean by Shahid’s dancing, and Vijay’s example is a very apt one. I wish our filmmakers get ‘inspired’ by interesting staging of stunts that Hollywood does – I think Kamal tries that in his movies sometimes, that intro scene in Manmadan Ambu comes to mind. MANK/Abhirup: I will say about this film what I said about “Go Goa Gone.” – ” it knows what it wants to do – clear a low bar – and does it fairly well.” It is no “Dabangg.” But I found it far more entertaining than “Bullett Raja,” though my review isn’t because of that. I genuinely enjoyed bits of this, and the rest I didn’t mind. The comparison came about simply because the 2 films had so much in common and they were just a week apart. Abhirup: “Dabangg” is a different kind of film. It is a dramatic story presented in the masala format. So the screenplay brings in all those elements you talk about, and it’s a smooth narrative where the characters build (and are consistent) and so on. This one’s not that kind of film. Here, the story is just a loose clothesline on which to hang “moments.” The rules are different. And the friend does give a reason for the solidarity at the end: If you big guys can keep shifting alliances, then we can too. It’s just a line (and I agree it could have been made a scene), but it explains what happened. venkatesh: So what are your favourite Vijay numbers? @ramitbajaj01: I have the same taste – it cannot be too “perfect” ; my favorites in that respect are Govinda and Shammi Kapoor and Shammi was an absolute master. On the above – i realised YT doesnt embed from time – so from 2:10 to about a minute after that. I don’t think the comparison with ‘Go Goa Gone’ is proper, Mr. Rangan. That one was consistently funny, and you actually came to care for the characters. You WANTED to see them safely depart from the zombie-infested island. As you rightly said, the film may not have set the bar high, but the low bar it did set for itself was cleared pretty well. Here, I think even the low bar wasn’t properly cleared. Compare this with Prabhu Dheva’s own ‘Wanted’. That too is a film which, as you say, uses the story as “a loose clothesline on which to hang “moments”‘. But the “moments” there are far more entertaining than here. If it is the moments rather than the overall story with which the film seeks to make a mark, then those moments have to be pack some genuine punch, right? Which moments–in terms of dialogue, action, or whatever else–makes you whoop in delight? None, as far as I am concerned. Here, “comedy” means Shahid Kapoor in a drag and Asrani babbling about horoscope and Ashish Vidyarthi going semi-naked. “Action” means, as I said earlier, the same multiple-guys-flying-in-slow-motion-across-the-air-and-smashing-everything-around-them-in-the-process that we have seen a gazillion times before. “Romance” means the hero and the heroine enacting the old-as-the-hills formula of initial misunderstanding morphing into love and then the hero going all out to save her from the villain (and none of this receives much in the form of fresh treatment). I repeat, where’s the “moment-to-moment vitality” that you speak of? I mean, do we really care about the well-being of Rajkumar? Are we really rooting for him and Chanda to get together? Does the clash between Rajkumar and Shivraj (and the other villains) have any real sense of danger? Does the friendship between the hero and his buddy register? I don’t think we can reply in the affirmative to any of the above. As for whether it’s better than ‘Bullett Raja’, well, I am not sure. To me, both are disappointments. ‘Bullett Raja’ aims high, and fails to hit the target. 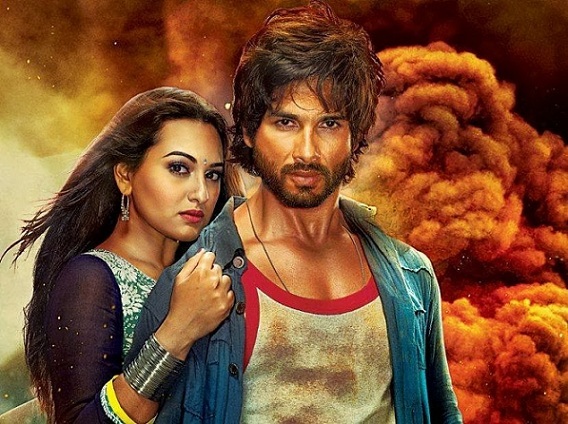 ‘R….Rajkumar’ aims much lower, but isn’t much of a target-hitter nevertheless. The former is an example of an ambitious film that doesn’t manage to fulfill that ambition. The latter is the umpteenth ‘dhishum-dhishum’ story, indistinguishable, really, from the countless others of its kind. I am afraid I shall have to disagree with the small-men’s-solidarity bit. Yeah, the friend gives a reason, but it’s not convincing. We are shown why the big guys–the villains–form an alliance and betray Rajkumar. Why do the small men form the alliance? Why should all those henchmen care what happens to Rajkumar? We don’t see any friendship between him and them; the only one he is close to is that bearded and long-haired friend of his. So why would they go against their bosses for a guy with whom they have no relationship whatsoever? And if that friend of Rajkumar’s convinced the rest to change sides, how did he do it? Shouldn’t we have been given at least one scene to explain this shifting of allegiance? The alliance of big baddies is based on mutual business interests. What is the alliance of the small men based on? That question has to be answered, however briefly. Or the alliance simply doesn’t ring true. I like these kinds of films but I wish that Prabhudeva made half as many and put twice as much into each one. But I guess then we couldn’t get the variety of stars that we do, and I’m excited to watch Shahid in this. I’m confident that I will thoroughly enjoy around 45 minutes of this, so I look forward to watching it one day even though I will surely end up fast forwarding through parts. The dancing in the promos is a joy and I’m sure there are other fun bits. I wish the action scenes in this sort of film had the same technique as the songs. I enjoyed the action of Rowdy Rathore on a very basic level, but it grossly underutilized Akshay. Boss was the only recent movie that I thought was a good showcase of his skills. Most masala movies shoot action for great trailer moments but the scenes themselves are really dull, even for action fanatics like me. The action in Rambo Rajkumar’s trailer looked great…but they have those trailer shots down to a science at this point. I grew up on James Bond movies and I liken these masala movies to Bond films from the 70s and 80s (the films from the 60s and the 90s forward had a bit more sense to them, I think). You watch them and check off the elements. Some of the elements are the same: songs, action scenes, girls, villains, villains’ lairs, exotic locations, cheesy one liners. If only Bond movies had dancing and masala movies had gadgets. Did you ever see Rajamouli’s Magadheera? That’s probably the best of the nonsensical southern style masala movies that I’ve seen. It is consistently inventive and surprisingly accomplished technically, and it has one of my favorite soundtracks of recent memory. another director who has always used sophisticated methods to give a punch in each scene-SHANKAR……. I agree with you about govinda and shammi kapoor. Govinda was the best both in exuding the sheer joy of dancing and really giving that pleasure to the audience as well . He used to make the most difficult steps look so easy.Shammi kapoor was a great improviser, he didn’t know any dancing but really when he boogies on screen there was none like him. But the name i would like to mention is of Bhagwan dada, the real pioneer of cinematic ishtyle dances in hindi cinema. Everybody from Bachchan to govinda is inspired by him.Naam bade aur darsan chote indeed. If you want to watch bond movies with dances and masala movies with gadgets watch suraksha,shaan, agent vinod (old one) and the greatest of them all Ulagam suttrumum valiban starring and directed by MGR. (Puratchi talaivar invents the kind of weapon of mass destruction that would put tony stark to shame). As for magadheera i liked it but just couldn’t tolerate that horrible hero who seems to have the same perplexed expression throughout. i prefer pokkiri and dookhudu . they were terrific fun with mahesh babu at the top of his game. Just wondering… is it a remake of any Souther film or an “original” one in that tradition? @MANK : I know of Bhagwan Dada and as you rightly point out – AB copied him – but Bhagwan Dada was no hero and i sort of restricted my selections to that. Re – Vijay numbers – Ayla ayla number in Pokirri with Mahesh Babu was better. No this is no remake (as far as official ones goes), This is Prabhu deva’ stab at making an original hindi pic (As original as he can get) :-). About pokkiri being banlieu 13, doesn’t it use enough wire techniques in the stunt sequences. I agree with you about pokkiri movie .also about the song as well which is better in telugu version . But i think the song picturisation in tamil is far superior especially the dance moves. Vijay is a better dancer than mahesh and prabhu deva’s choreography is terriffic, vibrant and energetic. While the telugu version is a little slow . (Yeah but illeana is red hot man :-)). Jitaditya: I haven’t seen Puri Jagannath’s film, so I won’t know. A number of people who have seen both, however, have said they prefer ‘Wanted’. I have to watch both to decide for myself. But regardless of that, what I wanted to say is that ‘Wanted’ is a “use the story as a clothesline for moments” kind of film that Mr. Rangan mentions, but it is a better one than ‘R….Rajkumar’, as those moments there are better than the ones here. How does a marketless (at least in South) guy like Prabu deva get to make movies in Hindi in the first place? Is Baaliwood so depraved that they have to roll out the carpet for the likes of KSR, Prabu deva to make masala movies for them?